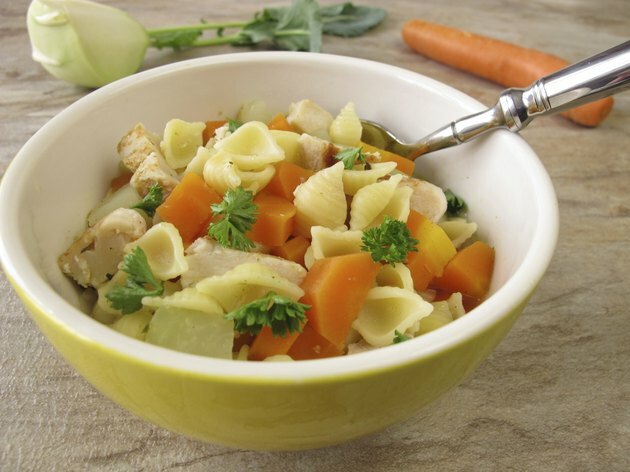 You can lose 10 or more pounds in a week by eating soup and certain combinations of foods, claim the guidelines for the seven-day Chicken Noodle Soup Diet. Also known as the Sacred Heart Diet, the Cleveland Clinic Diet and the Spokane Heart Diet, the program may help you lose weight, but it doesn't conform to the U.S. Department of Agriculture's recommendations for balanced, healthy eating. It also is not endorsed by any of the medical organizations that share its name, all of which deny the claim that they developed the diet to help heart patients lose weight. Don't start any version of the Chicken Noodle Soup Diet until you've spoken to your doctor. Followers of the Chicken Noodle Soup diet eat as much of the soup as they want along with that day's specified foods, such as bananas and skim milk on Day 4 or beef and tomatoes on Day 5. Some research, including a study presented by scientists at the Digestive Disease Week Conference in 2007, supports eating soup as a weight-control measure. A bowl of soup like chicken noodle soup eaten before a meal can decrease overall food intake by 20 percent. In addition, liquid-based foods like soup may help satisfy your hunger longer than solid foods. According to the National Institute of Diabetes and Digestive and Kidney Diseases, restrictive, low-calorie diets like the Chicken Noodle Soup Diet may help motivate overweight individuals to make the changes needed for healthy, sustainable weight loss when they experience success in just a few days. They may also see a quick improvement in the symptoms of weight-related medical conditions like diabetes, high blood cholesterol and hypertension. The institute cautions, however, that such diets are best conducted under a doctor's supervision and need to be replaced by a balanced diet and regular exercise to continue losing weight. Unless you focus on being more physically active and limiting your fat and overall caloric intake, it's likely that you will regain all the weight lost when your week on the Chicken Noodle Soup Diet is over, especially since most of the decrease in pounds is due to lost water or muscle, not fat. This may lead you to begin another round of the diet or to experiment with another restrictive crash diet, a practice that may result in a cycle of yo-yo dieting. Repeatedly gaining and losing weight can impair your immune system and increase your risk of cardiovascular disease. The Chicken Noodle Soup Diet has strict rules on what can or cannot be eaten on certain days of the plan, such as only fruit -- except for bananas -- on Day 1 and no fruit, just vegetables, the next day. Deviating from this plan will supposedly hinder weight loss. The Academy of Nutrition and Dietetics says this is not true; there is no reliable scientific evidence to suggest that restricting yourself to certain combinations of foods will help you burn fat or lose weight more efficiently.